I always look forward to spending Thanksgiving with Mom. She seems to (effortlessly) make the best turkey and mashed potatoes. 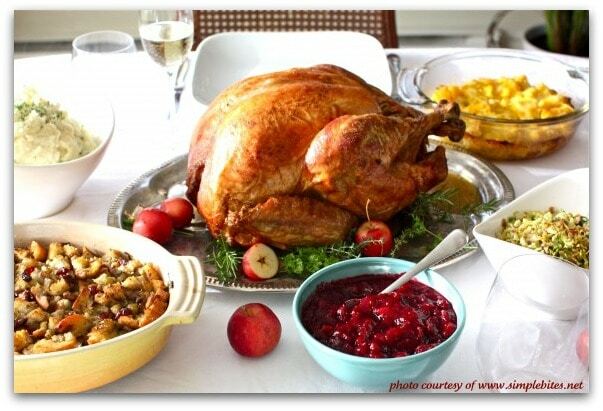 For me, a traditional Thanksgiving dinner menu is best! I should pay more attention to her gravy-making-method because that’s pretty much perfect too. Mom’s stuffing is flawless, with just the right amount of moisture, and she always adds in mushrooms and chopped up turkey giblets. My favorite Thanksgiving dish of all time is Mom’s Orange Delight Jello Salad. I’ve made it before, but I can never seem to get it to come out as nice as Mom does. She’s never made her own cranberry sauce, which (used to be) fine by me since I kinda liked the stuff that slithered out of the can. Munching black olives placed on every finger, I always stuffed myself silly on Thanksgiving Day at Mom’s house. I rarely see Mom on Thanksgiving now- saving our visit for Christmas instead. And I don’t usually do the black-olive-on-the finger thing unless no one is around. So now I’m the one who usually hosts Thanksgiving, and my husband’s side of the family joins us. Here’s the menu I’ve developed for Thanksgiving this year- with (mostly) traditional sorts of recipes. 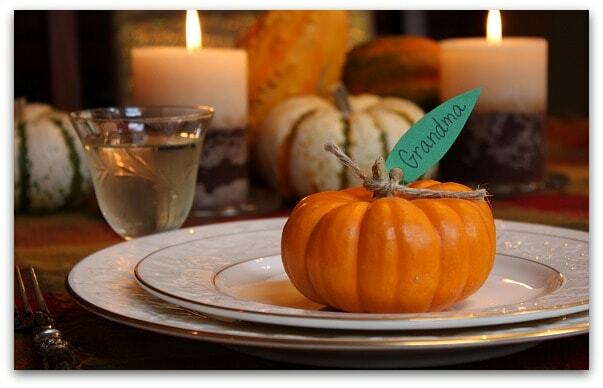 I saw this idea on Martha Stewart’s site using pears, and I thought it would be cute to use pumpkins for Thanksgiving to make a name plate for each of my Thanksgiving guests. I roasted a turkey last weekend to practice, and I used the wonderful tips and tricks that I found on SimpleBites. If you want your turkey to turn out perfect in every way, follow the SimpleBites turkey tutorial! There really are only a handful of ways to make a classic gravy. Fine Cooking has a great little video showing you how to make gravy from your turkey drippings. Comes out perfect every time. I don’t always make gravy from the turkey, so I use a simple homemade gravy recipe that I’ve become quite attached to. 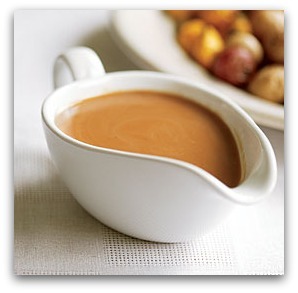 Go here for the recipe >> QUICK AND EASY MAKE-AHEAD GRAVY. It’s very good, and it’s the perfect alternative to making gravy from turkey drippings. 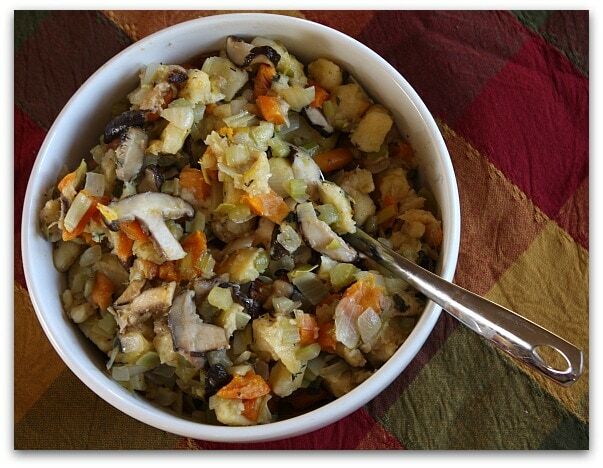 This is my very favorite stuffing recipe (besides Mom’s): Shiitake Mushroom Stuffing. I bake it on the side, but you can stuff your turkey with it if you’d like. I also like this recipe, which is more traditional >> CLASSIC STUFFING. And I always, always do these Make-Ahead Mashed Potatoes that you can keep warm in the crockpot. 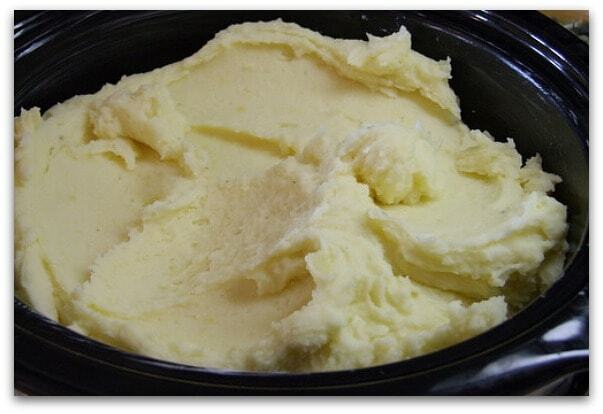 Or if you prefer >> HOW TO MAKE PERFECT MASHED POTATOES (you can keep these warm in the crockpot too). I’m frantic enough on Thanksgiving Day without having to worry about making mashed potatoes at the last minute. This recipe just makes things a lot easier. Mom never ever served up butternut squash, sweet potatoes or even yams at Thanksgiving, but I’m particularly fond of all three. 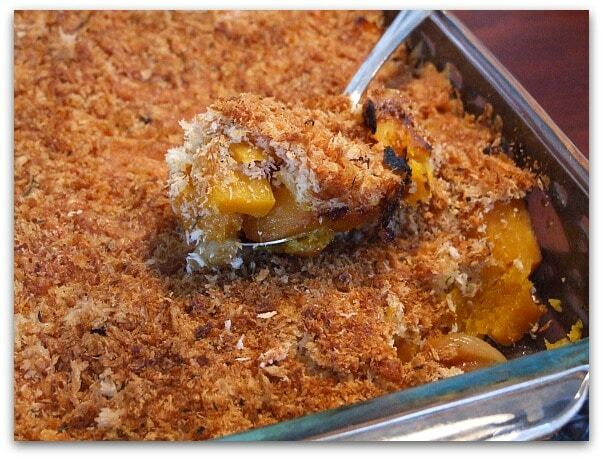 This makes a fantastic side dish- full of flavor and it makes a lot: Butternut Squash- Cheddar Gratin with Rosemary Breadcrumbs. I grew up eating that green bean casserole that everyone else grew up with, but to tell you the truth… as much as I loved it, it’s just too fattening to add to the other heavy things being served at Thanksgiving. I’ll be sharing a “fresh” version of the Thanksgiving Green Bean Casserole with you on Monday, but I do like to serve a lighter version of green beans if the rest of the meal feels too calorie-laden. 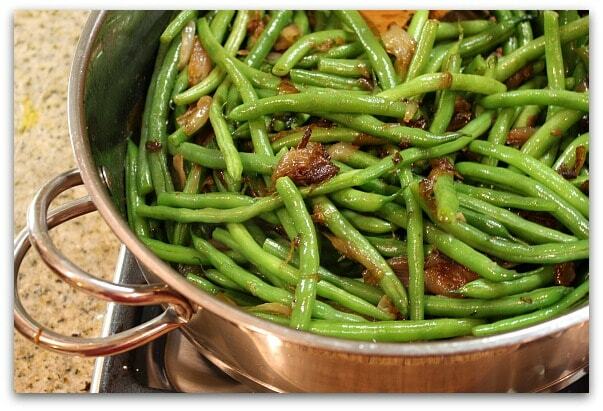 Here’s my “other” favorite green beans recipe: Green Beans with Caramelized Shallots. To save time and energy, you can certainly buy frozen rolls like Rhodes or Bridgford brand. That’s what Mom used to do, and they were perfectly delicious. You can jazz those up a bit by brushing on some butter and orange zest too. I like to use a very simple yeast rolls recipe. It makes exactly 24 small rolls, which is perfect for our family’s Thanksgiving. It’s kind of a no-fuss recipe (no kneading necessary)- just mix the ingredients and stick the dough in the fridge for a couple hours, then take it out and spoon out little balls of dough to roll up and stick in a 13×9-inch pan. Set them aside to rise until you’re ready to bake them, and they turn out just fine. I bake these early in the day and then just warm them up a little before the big dinner. 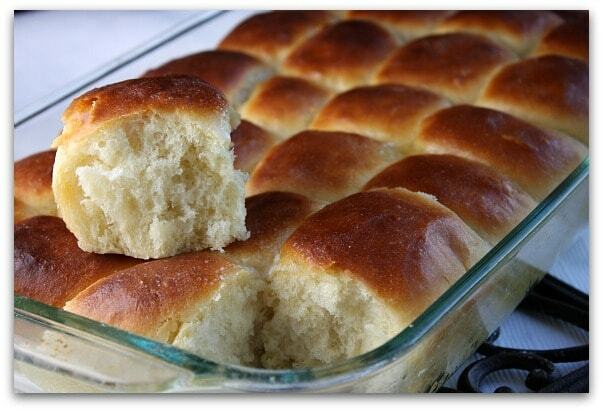 The recipe is simply called: Easy Dinner Rolls. I mentioned earlier in this post that I actually enjoyed the gelatinous stuff that slithered out of the can when I was little. Explanation: I didn’t know any better! It’s so very easy to make cranberry sauce that no one should be buying the canned stuff anymore unless it’s really what you prefer. 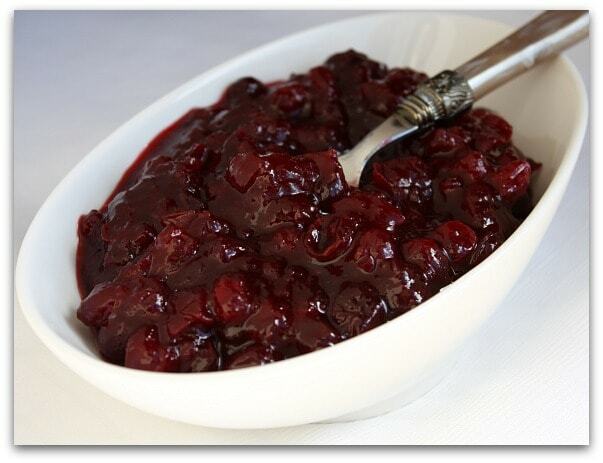 This is my new favorite (with just a hint of spice): Cinnamon- Kissed Cranberry Sauce. I firmly believe that at Thanksgiving you should offer (and eat) more than one dessert. 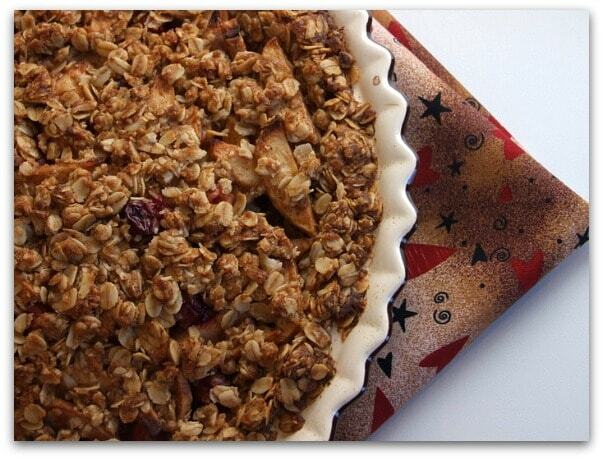 I like to bake my favorite pie with an alternative crust: Apple-Cranberry Pie with Oatmeal Cookie Crust. This one is also a big-time favorite >> CLASSIC DOUBLE CRUST APPLE PIE. 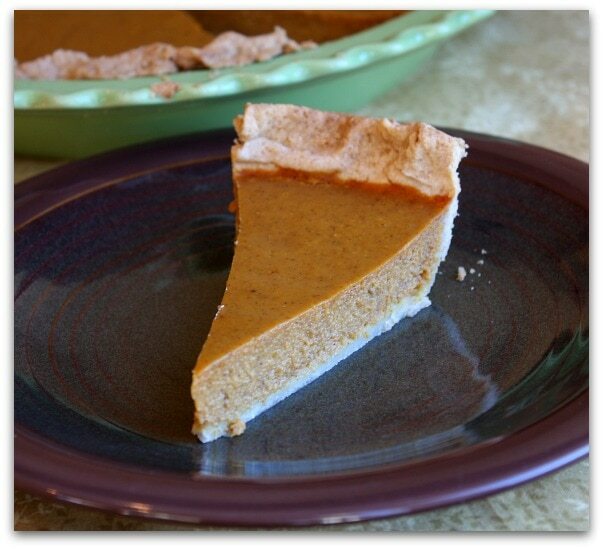 And since there is always someone who prefers something much lighter, this Maple-Pumpkin Pie adapted from Cooking Light is a simple, nice choice that I tried recently. It’s a good one to include if you’ve got anyone watching their weight at your Thanksgiving dinner. With olives on my fingers (and my husband and his conservative family eyeing me warily), I’ll be preparing this menu for a small crowd this year. All recipes for my Thanksgiving menu can be found by clicking on the recipe titles mentioned above. Oh, wow! I thought I was the only one who did the olives-on-each-finger thing. 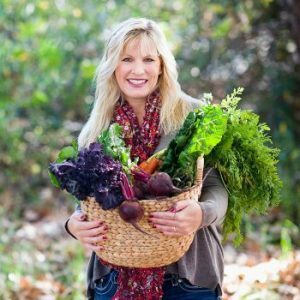 I found your site after your new cookbook was mentioned on The Slow Roasted Italian (I won the giveaway copy on her website!). lol, on the olives! I will have your book in the mail to you soon- next trip to the post office! I love the menu, I will incorporate some of your menu with mine and hopefully, it will be a success. Have just agreed to do a Thanksgiving dinner. I’m Australian and we don’t have that tradition, so thanks a lot for your menu. Looks great and I’m sure I’ll use almost all of it. You’ve made my task so much easier! Last year I made the gratin, both pies, and the cranberry sauce – OH EM GEE! Everything was delicious! Thanks you for these new holiday traditions! Thank you for the recipes and schedule. I did Thanksgiving all by myself this year and because of this post it was a smashing success. My turkey was even 23 pounds and every inch delicious. THANK YOU! Thanks for these great recipes! I stepped my game up this year and made everything from scratch, and with the help of these recipes, I received nothing but praise from the 20+ people I had over for Thanksgiving! Hey Lori, is that first pumpkin nametag photo your own original? Saw it on another site too and I knew it looked familiar! Yeah, that’s my photo. I’m sure I saw the idea somewhere… Martha Stewart, maybe… but my photo. I used to put an olive on every finger when I was little too – I could eat a whole can of those in one sitting! I’m trying the green beans with shallots recipe this year. Thanks! Everything looks so great and your photos are beautiful! I printed out your recipe for Apple- Cranberry Pie with Oatmeal Cookie Crust. I will convert it to gluten free and nobody will know the difference! Great post, Lori. Mom definitely knows (and cooks) best. Lovely post Lori! I feel full just looking at it (wishful thinking). I especially like the sound of your butternut squash/cheddar gratin. I’m in heaven over that one! Thanks for sharing the recipe. I typically host Thanksgiving at my home and would not have it any other way but this year I’m giving into the fact that although my leg injury is slowly but constantly improving, the idea of hopping around on one leg for a full day might be a bit much, so I’m going to a friends house this year. Or I could come to yours; looks fabulous! Amazing menu – what time should we be there! hehehe! Happy Thanksgiving!